2 Berth, Motor Mover, Alko ATC, Hitch Head Stabiliser, Fitting for Alko Secure wheel lock, Heki Roof Light, CD Player, TV Directional Aerial, Blown Air Heating, Hot Water, Mains, Curtains, Blinds, Flyscreens, Loose Fit Carpets, Side Kitchen, Fridge Freezer, Hob, Grill, Oven, Microwave, Extractor, Rear Washroom, Cassette Toilet, Shower, Hand Basin, Wardrobe, Clear on CRiS register, Full service on purchase, Six months warranty, Working demonstration on collection, REDUCED. 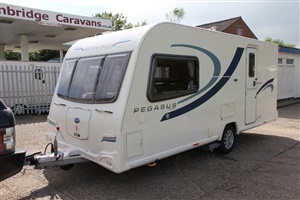 This 2 berth 2013 Bailey Pegasus Genoa Series II has had one owner from new and is in absolutely immaculate condition inside and out. This is a traditional 2 berth layout comprising of front lounge, side kitchen and very large rear washroom. This Bailey benefits from a top of the range auto-engage motor mover (Reich), as well as the choice of having the front centre chest of drawers or wrap-around seating fitted (both included). This Bailey will be sold with a full service, 6 months warranty and a working demonstration on collection. Please check our website - rather than eBay - for up to date opening hours, especially at Bank Holidays. We are closed on Wednesdays and Sundays. Please phone ahead of travelling if unsure.